Where there is a will, there is a way. 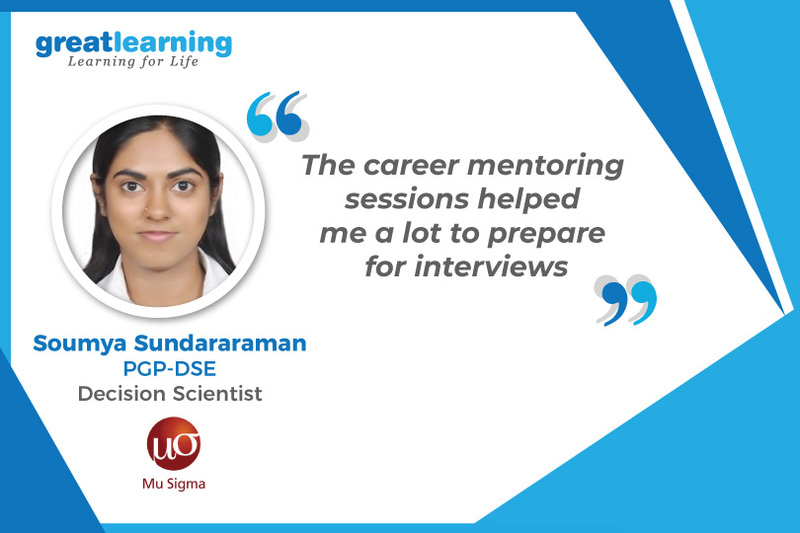 Read on to find out as Soumya, our PGP-DSE alumnus, tells us how being focussed and persistent helped her to transition into a data-oriented role, given her non-technical background. Why did you choose Great Learning to learn Data Science? I completed my graduation in BSc maths, economics and statistics from Christ University, Bangalore. After graduation, I took up the PGP-DSE program. I opted for this program because Great Learning has a good brand reputation and the duration of the program is only 6 months. I was always interested in maths and statistics and that’s how I developed an interest in data science, even though I am from a non-programming background. I didn’t even consider any other options before enrolling for Great Learning’s PGP-DSE program. There was a lot of hands-on learning and for someone like me who is completely new to programming, it was a kick start to learn all the new tools, especially python. It was easy for me to adapt because a lot of hands-on sessions used to happen. How did the curriculum help you prepare for data science? A lot of overviews were given about the field at the beginning of the program. For me, it was a very useful introduction. I became familiar with all the aspects of data science and got an idea of the various machine learning algorithms. When you have an idea of everything, you can figure out what you are good at and what can you improve on. Being averse to computer science, it was challenging for me to sit and do programming but I learnt after a fair amount of practice. How was your experience with Great Learning’s career support? I think we had good support from the Great Learning team in terms of placement grooming and career support. We had multiple CV reviews and mock interviews as well. Career mentoring sessions helped me a lot in terms of preparing for the interviews. Mr Srijit Ghatak, who was my career mentor, really helped me to prepare for the Mu Sigma process. He guided me on guesstimate questions, aptitude, logical reasoning, verbal ability, business approach etc. I was a bit disappointed when Mu Sigma was the only company to have shortlisted my profile, apart from Monexo and Saksoft during the career fair at Chennai. They had conducted aptitude test, group discussion followed by face to face interview. The course did, of course, help me in group discussion and the interview. My overall experience with Great Learning has been really good. If you are not from an engineering background, I think you should be emotionally strong as you will face a lot of setbacks in the placements. You are more like an outlier compared to others and you need to be prepared for that. Also, you will have to put more efforts than others. Concentrate and practice more to become comfortable with programming.